306 Commonwealth is located on the south side of Commonwealth, between Gloucester and Hereford, with 304 Commonwealth to the east and 308 Commonwealth to the west. 306 Commonwealth was designed by architect Henry Hyde Dwight and built in 1896 by Marquis S. Miller and George N. Miller, masons and builders. Henry Hyde Dwight had married in September of 1895 to Mary Alba Webster, and he designed 306 Commonwealth to be their home. The land for 306 Commonwealth was owned by Mary Alba (Webster) Dwight’s family: one-half interest held by her uncle, David Locke Webster, a leather and morocco dealer, and one half interest held by a trust for the benefit of her mother, Mary (Moulton) Webster, the widow of John Gerrish Webster, and their children: Ella Elisabeth (Webster) Hill, the wife of Chicago attorney James M. Hill; Mary Alba Webster; Clara Eunice Webster; and Frances Maria Webster. The lot was the western 19.62 feet of a 54.62 foot lot the Webster family had purchased on December 9, 1891, from David Greer. The Websters had sold the eastern 35 feet of the lot, where 304 Commonwealth would be built, in May of 1895. The 54.62 foot lot had been part of a tract of land originally purchased by Nathan Matthews on January 2, 1871, from David Sears, Jr., Frederick R. Sears, and Knyvet Sears. Click here for an index to the deeds for 306 Commonwealth. 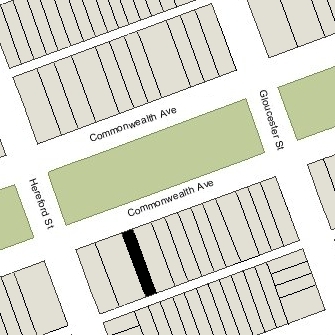 On December 28, 1891, soon after buying the lot at 304-306 Commonwealth, the Webster family entered into an agreement with Samuel and Ann E. (Dutton) Mandell, owners of 302 Commonwealth, limiting the depth of any buildings built on the land at 304-306 Commonwealth. When the Websters sold the lot at 304 Commonwealth, they included restrictions in the deed for the benefit of their remaining land at 306 Commonwealth limiting the depth of any building built at 304 Commonwealth and restricting the location of windows overlooking each others’ premises. On July 25, 1896, they agreed to modify the earlier restrictions to allow construction of an ell at 304 Commonwealth. By the 1896-1897 winter season, Henry and Mary Alba (Webster) Dwight had made 306 Commonwealth their home. They previously had lived at 5 Brimmer. On January 25, 1897, soon after 306 Commonwealth was completed, David Webster transferred his one-half interest in the property to the trust established for the benefit of Mary (Moulton) Webster and her children, and on July 6, 1897, the trust transferred the property to Mary Alba (Webster) Dwight. 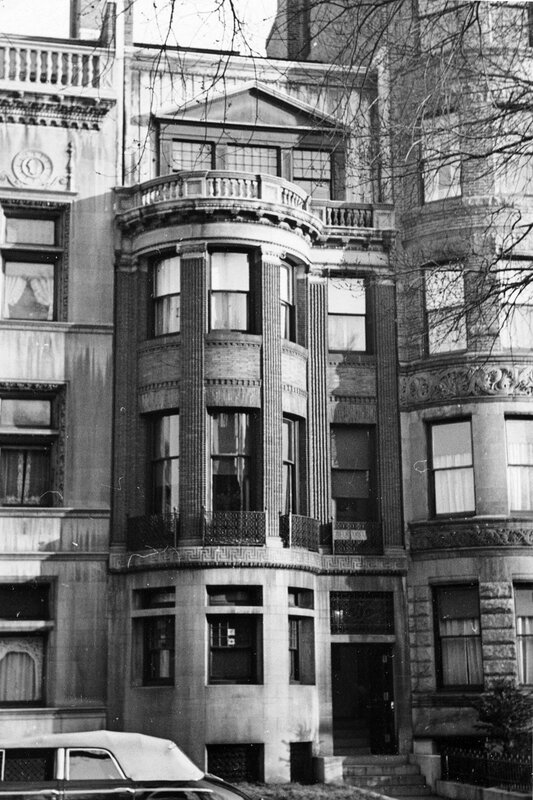 The Webster family also owned The Imperial at 308 Commonwealth, which they had purchased in March of 1891, and the deeds conveying David Webster’s interest in 306 Commonwealth to the Webster family trust included restrictions for the benefit of 308 Commonwealth, including limiting the buildings that could be constructed in the rear of 306 Commonwealth and specifying the right of 308 Commonwealth to maintain windows in the party wall, subject to the right of the owners of 306 Commonwealth to close them up if necessary in conjunction with constructing any building or addition on their property. The Dwights continued to live at 306 Commonwealth until January of 1904, when they moved to California because of his ill health. On August 10, 1904, George R. Weed, an attorney, foreclosed on a mortgage from Mary Alba Dwight and took possession of the property. During the 1904-1905 winter season, 306 Commonwealth was the home of Col. Albert Augustus Pope and his wife, Abbie (Linder) Pope. They also maintained a home in Cohasset. 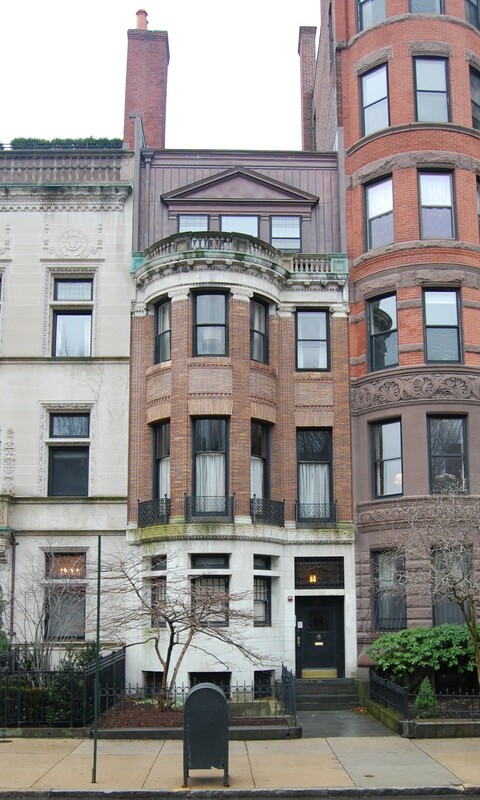 Their usual Boston residence was at 378 Commonwealth, where they had lived until the 1901-1902 season, and where the resumed living by the 1906-1907 season. Col. Pope was a pioneer bicycle manufacturer, maker of the Columbia bicycle. His Pope Manufacturing Company was located at 221 Columbus. From 1897 to 1899, his company also produced electric vehicles, and from 1903 it manufacturer gasoline-powered automobiles (the Pope-Hartford, Pope-Toledo, and others). On June 1, 1905, 306 Commonwealth was acquired from George Weed by David Crowell Percival, Jr. He and his wife, Harriette E. (Williamson) Percival, made it their home. They previously had lived at 636 Beacon. They also maintained a home, Gray Court, on Marblehead Neck. David Percival was a wholesale jeweler with D. C. Percival & Co., founded by his father. On January 31, 1925, he transferred the property into his and his wife’s names. The Percivals continued to live at 306 Commonwealth until about 1943, but had moved to The Puritan at 390 Commonwealth by 1944. The house was shown as vacant in the 1944 and 1945 City Directories. On January 22, 1945, 306 Commonwealth was purchased from the Percivals by Julia (Giulia) (Leverone) Arata, the widow of Paul (Paolo) Arata, and her son, Fred L. Arata, a retail liquor dealer and real estate investor. Fred Arata and his wife, Annette Flossie (Crovo) Boggiano Arata, lived in Brighton; his mother lived with them. In February of 1945, he applied for (and subsequently received) permission to convert the property from a single-family dwelling into five apartments. Julia Arata died in April of 1952 and on August 31, 1955, 306 Commonwealth was purchased from Fred Arata by Frederick Elmer Farnum, an optometrist, and his wife, Julia Frances (Smith) Farnum, a manufacturer’s representative. They lived at 328 Commonwealth, where they operated a lodging house. 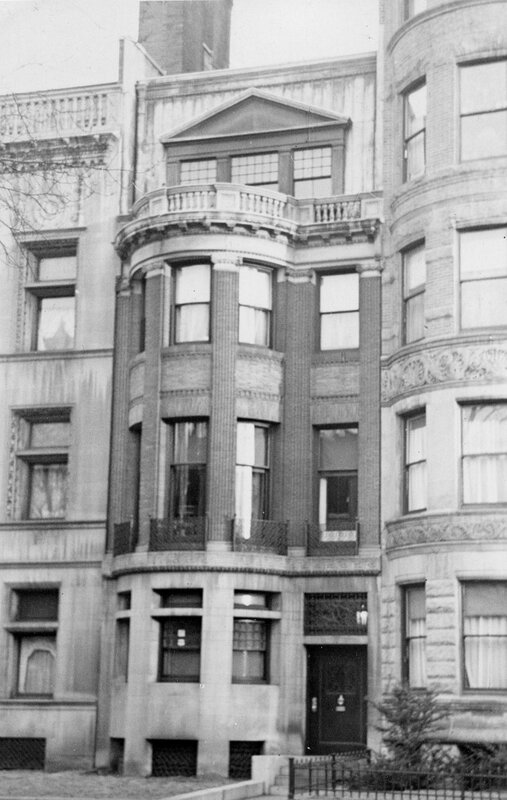 The property changed hands and on September 10, 1962, was acquired by Florence (Goldberg) Cohen, the wife of Arthur Irving Cohen, a dentist. They lived in Newton and he maintained his office at 306 Commonwealth. He previously had maintained his office at 348 Commonwealth. On January 14, 1980, she converted the property into five condominium units, the 306 Commonwealth Condominium.306 Commonwealth Condominium.